Our first year in Germany we discovered the absolute insanity that takes place on New Year's. A massive display of bangs, booms, bright lights, and beautiful colors take over the sky for one night in Germany. 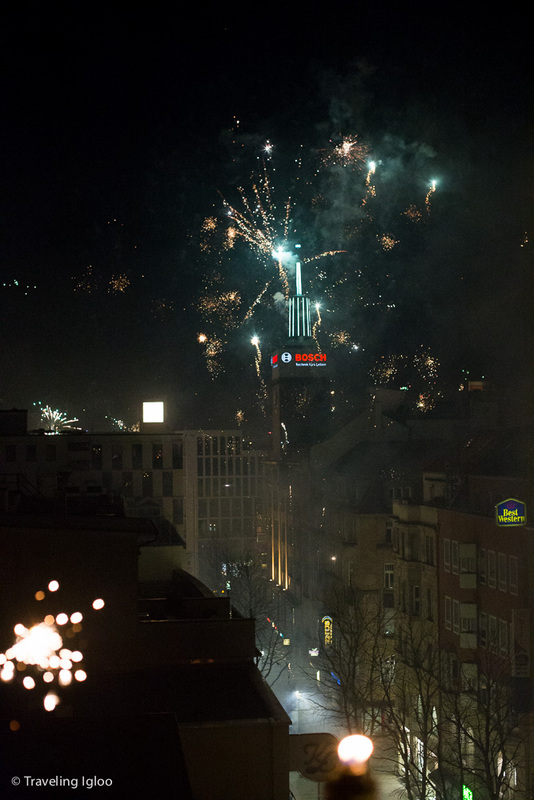 On New Year's there aren't any fireworks restrictions and Germans take full advantage of this lifted law. Everywhere from Munich and Berlin, to smaller cities like Stuttgart and even small towns like ours outside of the city, get littered with remnants of fireworks during the night. Usually there are a few practice runs on the days leading up to New Year's; a pop here, a bang there, but New Year's is the grand show. I really can't put into words how crazy it is. It's not like some beautiful fireworks display that's state run and happens for fifteen minutes. No no. Every one in Germany can purchase fireworks anywhere, they're even sold at grocery stores, to set off for New Year's. The hospitals see their fair share of burns on January 1st. I'm just glad I wasn't one of them. We went to a friend's house who happens to have an exquisite flat located in downtown Stuttgart, with a rooftop balcony overlooking much of the city. Many people emerge from bars and clubs down below for the show and to have their own fun but I don't think I would want to be on the ground floor. Besides the obvious threat of fireworks flying by and hitting you, you can't see anything because smoke starts to fill the sky. The fireworks did not disappoint. We lucked out with the weather this year, the skies were clear and there wasn't even a slight breeze to deter us. The party also didn't disappoint. My hangover the next day concurred that I had an excellent time. Here is a short video I put together from the night, starting off with us lighting a firework while heading to the party, then at the end it shows the madness that happens on New Year's! I only have a few photos which is quite unfortunate since I had just purchased a new tripod for the occasion so I could finally get some good shots of the fireworks. The ballhead, or the thingy that connects my camera to the tripod, didn't fit my camera so I couldn't use it. Needless to say I'm a bit upset with my camera store for telling me everything would work fine. Lesson learned...always try it out at the store!